My book choice today has a flavor reminiscent of the work of Mr. Sendak…it celebrates mothers (yes, Mother’s Day is only a few days away)…and shows what they have to deal with on a daily basis…the good, the bad and the ugly. From an Amazon reviewer: “No and David were the first words David Shannon learned how to spell. Shannon’s Caldecott Honor Book No, David! is based on a book he made as a child showing a kid doing all the things he isn’t supposed to do. In the sequel David Goes to School, it turns out that teachers say no, too. David’s mother used soap to wash out his mouth when he used inappropriate language, but you can utilize a bar of soap with your children in a much more enjoyable way. 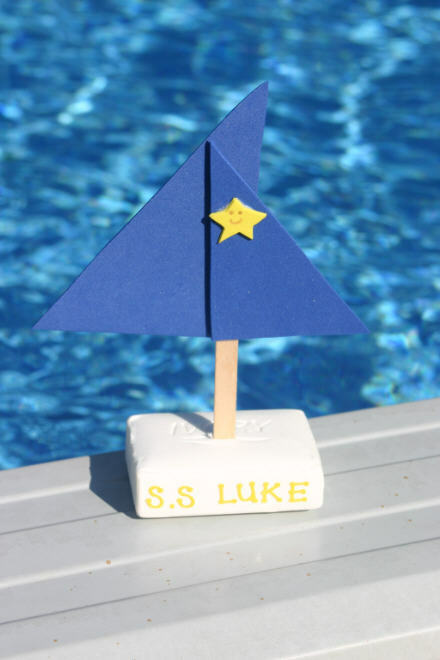 Make this super boat and customize with your child’s name. They will be begging you to take a bath! 1. Un-wrap a single bar of soap. 4. Decorate the sail; we used a small star out of the foam paper in coordinating color. 5. Insert Popsicle stick into soap. 6. Name your boat with letter stickers. The above instructions and picture came from the website of The Crafty Noodle. This post is part of a series for parents and teachers called Perfect Picture Book Fridays hosted by Susannah Leonard Hill. This entry was posted in children's toys, Crafting with Children, Perfect Picture Book Friday and tagged Caldecott Medal, children, David Shannon, Maurice Sendak, Mother's Day, Perfect Picture Book Friday, Susannah Leonard Hill, Where the Wild Things Are by viviankirkfield. Bookmark the permalink. I’ll have to read that one and thanks for the craft, my kids will love that! Your craft activities are amazing. I think this one sounds like a great tribute to Sendak in the week of his death, as it is so authentic to childhood! Thanks so much, Susanna! David does try his mother’s patience, doesn’t he? Just like real life!!!! I love David Shannon books. This is such a great choice for kids as they certainly relate. Great message too. Love your activities too! I want a Soap Boat, too! We see the grandchildren next week, and I’ll have all the supplies ready! Thanks, Vivian. Great, Marylin! They are really fun to make…and use. 🙂 Looking forward to reading your Mother’s Day card contest entries! The cover is one that shouts “pick me up and read me!” I do like David books. I will have to check this one out. Oh, how David reminds me of my youngest. The other day he told me pushing was ok, if it was an accident. Sometimes it’s nice to have a reminder that most children (and parents) go through this. I know, Kirsten…how funny! Kids can be so amazing when they turn things to their advantage…partly through their child-like innocence and partly through their insightful cleverness. Parents and kids alike love to see stories about kids who are not perfect. Helps us feel normal! Thanks for the recommendation, Vivian! 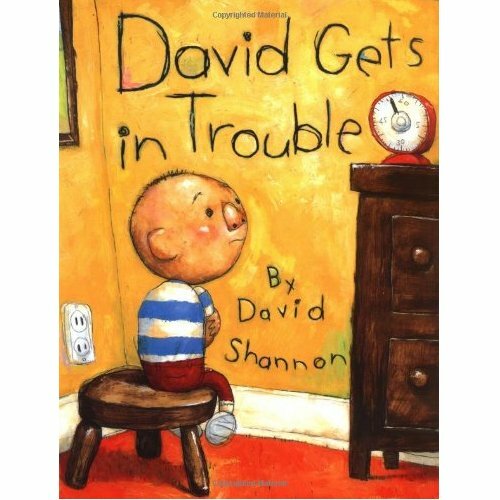 We love all of David Shannon’s books! He really gets what it is to be a little boy and I love his own story about drawing all the time as a kid. My kids love the part (I’m not sure it’s in this book but I think so) where he pees in the snow. They didn’t even get it the first time because we don’t have snow here, so it’s hard to imagine what it would be like. It was quite a funny moment at our house! It’s so great for a kid to read about another kid who does the things he has done (and probably been punished for doing). A lovely book and a lovely tribute. Thanks, Diane…sorry I was MIA for awhile…had a wonderful time with my son over Mother’s Day weekend. 🙂 I’ll post some pics, possibly next week with my PPBF blog. This craft looks cool! Happy mother’s day, Vivian! 🙂 I got your book already and I’m on to reading every page 😀 .. I’m highligting my favorites. loving it so far. I’m gonna write up an article as soon as I get the chance. Please don’t stress about when you post the review…glad you are enjoying going through it. And Happy belated Mother’s Day to you, as well!!!! Happy Mother’s Day, Vivian! Hope you had a FAB day. I appreciate your sweet wishes, Nancy! I know I’ve fallen behind but I have all the posts I missed and will complete my visits soon. Its a slow process for me because I’m going alphabetically and I have over 2500+ emails down by 1000. TY for your patience! the again pain remedy west London range widely. Listed here are some that arise usually, plaguing dogs and their homeowners. A dog which has a Cherry Eye often has a pink lump at the corner of the eye. They are readily avaailable for no-cost and players can use these straight without getting them.